Samsung Galaxy Note 9 is tipped to have a battery pack significantly larger than the 3300mAh battery powering last year's Galaxy Note 8. The new development emerges days after the design of the new Galaxy Note series handset leaked online. Unlike the Galaxy S9 and Galaxy S9+ flagships that debuted earlier this year with a vertically placed dual rear camera setup, the next Galaxy Note model is expected to feature a horizontal dual rear camera setup that will make space for the larger battery pack. In a separate news, various colour options of the new Galaxy Note surfaced online. Samsung is speculated to launch the phablet flagship at its "Unpacked" event in New York on August 9. Tipster Ice Universe on Twitter revealed that the Galaxy Note 9 will come with an as large as 4000mAh battery. This is 700mAh larger in capacity over the battery of the Galaxy Note 8. Previously, it was rumoured that the new Galaxy Note model will include a 3850mAh battery. The new rumour comes in line with the reports highlighting a horizontal dual rear camera on the Galaxy Note 9. The horizontal setup will help Samsung add the larger battery pack. Moreover, the upgraded battery pack will give enough power to continue to deliver at least a day of juice even with the slightly larger display that is rumoured to come in 6.4-inch of size. Separately, folks at AllAboutSamsung have managed to leak various colour options of the Samsung Galaxy Note 9. The handset is said to come in five colour options instead of the four colour options available with the Galaxy S9 family. These include Black, Blue, Brown, Gray, and Lavender. 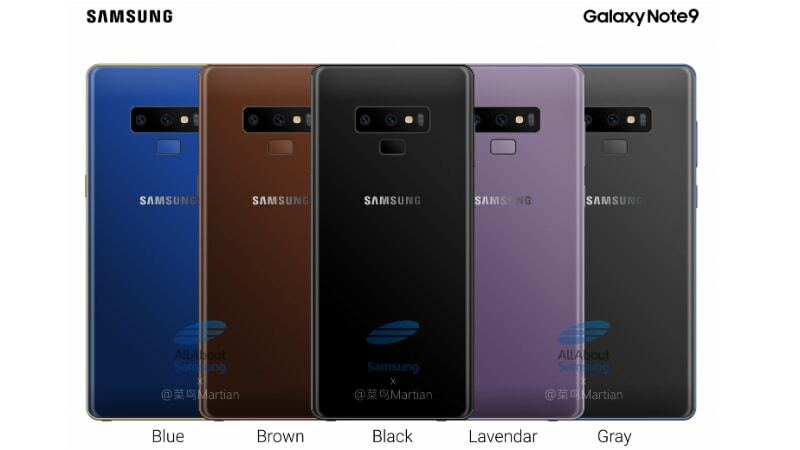 Notably, the Galaxy Note 8 had Midnight Black, Orchid Gray, Maple Gold, and Deep Sea Blue colour options, while the Galaxy S9 models were originally launched in Lilac Purple, Midnight Black, Titanium Gray, and Coral Blue colour options and received Sunrise Gold and Burgundy Red last month. As per some previous reports, the Galaxy Note 9 will come with an upgraded camera experience and feature looks similar to the Galaxy Note 8. It is expected to have the Snapdragon 845 SoC for the US market, while its global variant will be powered by an Exynos 9810 SoC.